The American Eskimo dog is a chipper white dog that looks a bit like a miniature Husky. These talkative dogs come in three sizes but are always white with perky ears. Playful and a bit mischievous, American Eskimo Dogs keep their owners on their toes with high-energy antics. They are known to be a bit reserved with others and can be too vocal for apartments, but this breed is a perfect balance of brains and beauty for the right owner! Group: Non-Sporting Group (AKC), Northern Breed Group (UKC). Coat and Color: Thick and glossy, almost always pure white. This breed has a characteristic thick ruff of fur around the neck and chest. Color: this breed is almost always a pure snowy white. It’s also acceptable for American Eskimo Dogs to be slightly cream-colored, but this is less common. The eyes, lips, and nose should be black. The American Eskimo Dog, or Eskie, is actually a breed created by German immigrants in the upper Midwestern United States, not the Eskimos. German farm owners in Minnesota, Wisconsin, and Ohio brought with them German Spitz dogs, an all-around farm dog. Like most Spitz breeds, the German Spitz had a curly tail, a thick coat, and pointed ears. The breed was refined into its flashy all-white version over time, and its charming looks and quick wit quickly earned it a place with circuses and vaudeville acts. In fact, one of the most famous dogs of all time was an American Eskimo Dog by the name of Pierre, a tightrope walker from the Barnum & Bailey Circus. The German Spitz breed’s name was changed after World War I thanks to anti-German sentiment. The name “American Eskimo” was chosen to honor an Ohio breeding kennel of the same name. Although the breed has a long history of being an all-purpose farm dog in the Midwest for decades, it was only recognized by the AKC in 1995. American Eskimo Dogs still make excellent training partners for trick dogs, obedience, agility and more—but they’re generally kept as pets rather than working farm dogs. Are American Eskimo Dogs Good Family Dogs? This alert breed can range from friendly and easygoing to overly alert and reserved with strangers. While many American Eskimo Dogs can be excellent family dogs, others struggle with the bustle of family life. These dogs need lots of attention and care, which can make them difficult for busy families. While they often play well with older children, their high-energy nature can be too much for younger children. Each dog is an individual, and it’s best to work closely with a breeder or rescue to find an individual that’s a good fit for your home. Eskies are commonly described as “busy” dogs that need quite a bit more exercise and mental enrichment than some other small, white, fluffy breeds. Unlike Shih Tzus and Bichon Frises, Eskies were working dogs just a few decades ago. As such, this breed requires daily stimulation. A walk or even a game of fetch won’t cut it for these dogs—they need mental challenges as well as physical exertion. Food dispensing toys and trick training are both fun ways to help work your dog’s mind. In fact, teaching American Eskimo Dogs different tricks like “wave” or “sit pretty” can function as a workout to strengthen your dog’s back and core muscles. Without proper exercise and enrichment, this breed quickly becomes destructive and vocal. This breed is known for a wide variety of barks, yips, yowls, and even screams that can drive your neighbors batty if left unchecked. Focus on giving your Eskie what she needs using the four steps to behavioral wellness, and keep in mind that this is a barky breed who may not live in harmony. Tools like bark collars may silence your dog but are likely to cause redirected frustration in the form of digging, chewing, or other distress behaviors. Frequent hikes, activity walks, training games, and dog sports can help keep your American Eskimo Dog content. Generally, this breed is smart and easy to train. In fact, training these dogs is so much fun that you might be motivated to pursue an AKC Trick Dog Title! Try to give your dog an hour of activity per day and three different activities per week. Focus on keeping training fun and lighthearted, and don't expect perfection. If a session is getting frustrating, try to make it easier or cut it short for the day. Grooming American Eskimo Dogs requires constant vigilance—this small, hairy breed can get out of control fast. Brushing these dogs several times per week will keep things under control and help reduce shedding. Take special care to work out mats around the harness, collar, ears, and rump areas. Long-haired double-coated dogs generally need a variety of grooming tools, including rakes, bristle brushes, rotating-tooth combs, and wire pin brushes. Don't shave Eskies, even in the summer—this can damage their double coat and actually reduce their ability to deal with heat or cold. The American Eskimo Dog is a relatively healthy dog breed, probably due to its recent history as a working dog. This breed is vulnerable to hip dysplasia, luxating patellas, and eye issues. Diabetes is also a problem for this breed. While there’s a significant genetic component to diabetes, it’s also important to feed regular meals of high-quality food. Free-feeding your dog (providing food at all times) and high-fat diets can contribute to diabetes even if your dog isn’t overweight. Some of these problems are best avoided by finding a good breeder and ensuring that they do appropriate health testing. Keep in mind that good health testing is much more extensive than just a veterinary checkup—the parent dogs generally need genetic testing and/or medical imaging to rule out genetic issues. Once your dog is in your home, you can ensure she lives a long and healthy life by keeping her well exercised and feeding her high-quality food. Despite being naturally athletic, the American Eskimo Dog gains weight rather easily. This might be due to genetic factors or because their thick fur makes it hard to tell if they’re putting on the pounds. Rubbing your dog along the ribs can help you feel for his true size. You should be able to feel the definition in your dog’s hips and a few ribs quite easily, though they shouldn’t protrude out either. Puzzle feeders help slow your dog down and burn off energy, and can really help your dog enjoy his high-quality dog food. Avoid high-fat food with this breed, as this might increase their already high risk for diabetes. 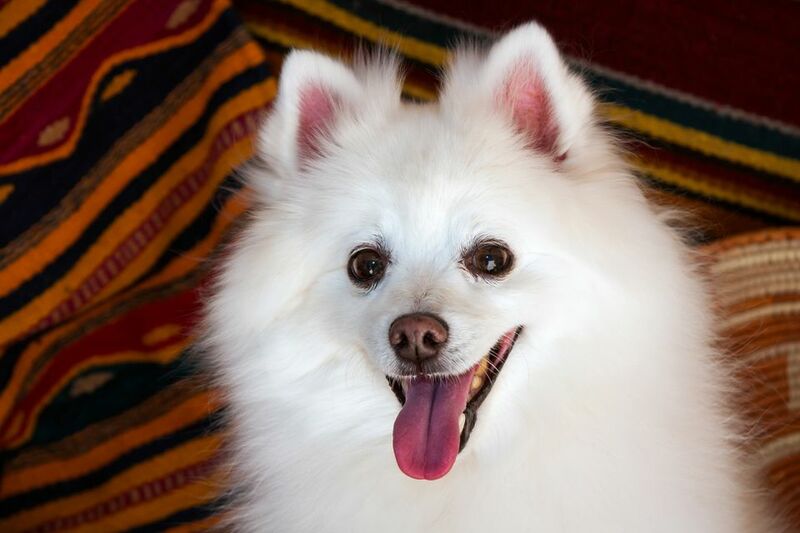 The American Eskimo Dog Club of America is a great place to start your search for a breeder or a rescue organization with leads on adoptable Eskies. Just be aware that the club does not endorse or monitor the practices of any of its breeder members. Is an Eskie right for you? Before you bring home an American Eskimo Dog, you might want to explore some other similar breeds to compare their personalities and needs. Be sure to speak to owners, breeders, and rescue groups and meet a few American Eskimo Dogs in person to learn more. Otherwise, check out all of our other dog breed profiles. There’s the perfect companion out there for everyone!